This dish was inspired by a recipe published on Bon Appetit in December 2009. My first attempt resulted in burnt grapes, but those grapes were oh so delicious. I have modified the recipe to speed up the cooking process and avoid burnt grapes. I have also added small peewee potatoes (about the same size as the grapes) to the roasted grapes and shallots, which makes the dish almost a one-pot meal. 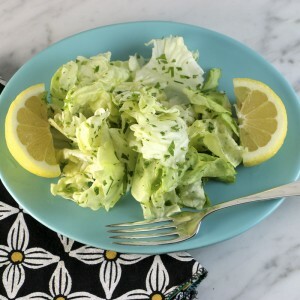 Add a simple green salad and you are good to go. The beauty of the dish is it really only takes about 15 minutes of active preparation time. Because I spatchcock the chicken, the total cooking time is 40-50 minutes so you wind up with a great meal in under an hour. This recipe is weeknight suitable as well as a great last minute entertaining dish. Spatchcocking simply means to remove the backbone of the chicken so it is butterflied, and then flip it over and press it down so it lies flat. This allows the chicken to roast completely in 40-45 minutes instead of an hour plus, and results in more crispy skin because none of the skin sits in the bottom of the pan. And more crispy chicken skin is always a very good thing. The best way to spatchcock chicken is to use a heavy duty pair of poultry shears. 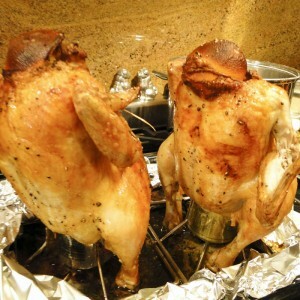 You can also spatchcock a chicken with a sharp knife, just be very careful when cutting into the slippery chicken. See this Wall Street Journal article for simple instructions. Alternatively, the cheater way is to ask your butcher to spatchcock it for you. There is typically no charge for the extra butcher work and it saves you a step. Tell your butcher you would like the chicken spatchcocked, and if he is not familiar with that term ask him to butterfly the chicken. There is no shame in letting the butcher do the work! If you don't have one, please consider buying a good thermometer. The best way to tell if a chicken is done is to check its internal temperature. Checking temperature avoids underdone chicken (gross) and overdone chicken (dry). It also avoids the cutting-into-the-chicken test which makes your beautiful roast look ugly and releases all the juices. This is the thermometer I use for everything from meats to checking my homemade yogurt temperature. This might sound crazy to you, but studies show the best way to protect your family against poultry-caused salmonella poisoning is to a) not wash your chicken (it just splatters the bacteria), and b) make sure you cook your chicken to 165 degrees. I was an adamant chicken washer for many years and have given up this extra step for safer chicken. Read my post to find out why. Heat the oven to 400 degrees. 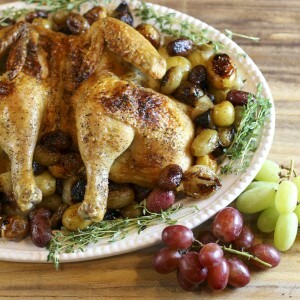 Put the grapes, potatoes and shallots in a roasting pan. Drizzle with 2 T olive oil and use your hands to coat all the fruits and veggies. Sprinkle with half the herbs and season with salt and pepper. Rub the chicken down with the remaining olive oil. Season with remaining spices, salt and pepper. Place the chicken on top of the fruits and veggies. Arrange the shallots so they are not underneath the chicken. Roast for 40 to 45 minutes, until internal chicken temperature reaches 165 degrees. Turn the fruits and veggies after about 25 minutes and return to the oven to finish roasting. Allow to rest 5 to 10 minutes before carving. Quick and easy prep. Roasting the chicken right now, and if it tastes half as good as it smells, we are in for a delicious dinner! Hope it was wonderful Jennifer. Let us know what you think. I love how quickly the spatchcocked chicken cooks! I have always been afraid of cooking whole chicken’s but the instructions for this seemed easy to follow, so I made it for dinner tonight. It was delicious and as easy as you claimed.